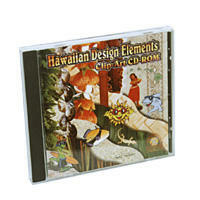 Volume 1 contains many clipart design images of Hawaiian designs, background textures and illustration design elements to give your creations a Hawaiian look. It still surprises us just how often we see these elements used in ads, magazines and other publications all over Maui and the other Hawaiian Islands. We use them all the time ourselves and hope you find just as many uses. Have fun! You can use the drop down menu below to view samples of the actual files.